Herniated disc sufferers usually have pain bending forward, twisting, lifting, coughing or sneezing. Most are 35 years of age and younger and usually their pain goes away with standing or bending backwards. 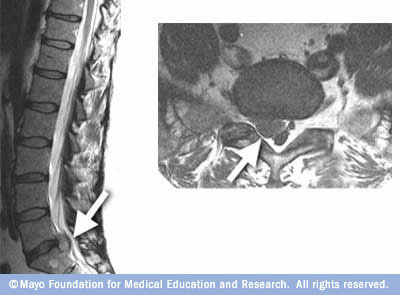 If you took an MRI of 100 random people WITHOUT back pain, how many would have a disc bulge or herniation on their MRI? 80! 80% of people have disc herniations or bulges on an MRI but do NOT have pain. This is why MRI's/X-rays are sometimes useful but can often send an inexperienced physical therapist following the wrong "rabbit trail" and frustrating both the patient and the therapist. There is a space between the bones in your back. In this space there is a disc that acts as a shock absorber to help with the forces in your spine. The disc is surrounded by a gel-like substance. This is held together by a wall of fibers. Due to repeated stress and force (from bending forward and lifting repeatedly, or from a trauma like a car accident), these fibers can break down. This allows some of the disc material and gel to push out and put pressure on the nerves in the lower back. When this happens, the back pain and sciatica sufferer can usually take their finger and trace the sciatic nerve down the back of their leg. This is true "Sciatica".